Beautifully sited 37 km W. of Glasgow on the N. shore of the Firth of Clyde, Helensburgh was founded in the second half of the 18th century by Sir James Colquhoun, 8th Baronet of Colquhoun and Luss. 1 Regular sailings of steamers to and from Glasgow began in the early 19th century, and following the arrival of the Glasgow, Dumbarton and Helensburgh Railway in 1857, the burgh grew rapidly into an affluent commuter town. Development of the upper town, with its spectacular views S. over the firth, was encouraged by the opening there of a station on the West Highland Railway Line in 1894, and over the next 10 to 15 years this elevated site was covered with large villas, including major works by leading architects. 2 It was here in 1902 that the Glasgow publisher Walter W. Blackie feued the choicest plot at the highest point of the town and commissioned Mackintosh to design The Hill House. I put to Mackintosh such ideas as I had for my prospective dwelling; mostly negative, I may say. I told him that I disliked red-tiled roofs in the West of Scotland with its frequent murky sky; did not want to have a construction of brick and plaster and wood beams; that, on the whole, I rather fancied grey rough cast for the walls, and slate for the roof; and that any architectural effect sought should be secured by the massing of the parts rather than by adventitious ornamentation. To all these sentiments Mackintosh at once agreed and suggested that I should see 'Windyhill', the house he had designed for Mr. Davidson at Kilmacolm. An appointment at 'Windyhill' was arranged and my wife and I were shown over the house by Mrs. Davidson, and left convinced that Mackintosh was the man for us. Blackie's account of his own leading role in deciding the look of the house may not be entirely accurate, since he was describing events that took place four decades earlier. Nevertheless, client and architect were evidently in sympathy, and determined to produce a house quite different from local precedents. According to Blackie, Mackintosh handed over the completed building 'early in 1904' with the following words: 'Here is the house. It is not an Italian Villa, an English Mansion House, a Swiss Ch�let, or a Scotch Castle. It is a Dwelling House.' 4 Whether or not these were Mackintosh's exact words, their meaning is fully borne out by the architecture of the house, which is remarkable for its refusal to ape historical styles, and its embodiment of a humane approach to design, focused on the needs of the user. According to Blackie, Mackintosh chose Ballachulish slates for the roof, and work was halted when supplies ran out due to a strike at the quarry. 8 However, on one of Mackintosh's elevational drawings the slates are identified in his hand as 'Aberfoyle Grey'. 9 He may have changed his mind in favour of the more expensive Ballachulish slates after the drawings were made. The main entrance is in the W. front, which appears less expansive than Mackintosh intended because the billiard room he planned to the left of the door was never built. (As shown on his perspective drawings, the billiard room was a simple gabled rectangle. It was to have had a remarkably long, horizontal window in its N. wall, with a single expanse of gridded glazing, unbroken by any mullion.) The doorway, with its massive lintel that doubles as a bracket for the projecting window above, has the same almost primitive character as that at Windyhill. Its monolithic square piers also recall W. Dunn & R. Watson's 1891 entrance porch at the Fortingall Hotel, Perthshire. Writing in the 1940s, Blackie stated that the layout of the interior was designed first, and determined the exterior. 14 This may be broadly true, but some of the complicated interlocking of planes and volumes visible outside, particularly around the gable of the cross wing, bears little relation to the rooms inside. It is determined by Mackintosh's sense of beauty rather than by functional considerations. The S. elevation directly overlooks the garden and the distant firth, but the E. and W. elevations are ingeniously designed with set-backs and projections so that rooms here can also enjoy the view. This is the reason for the canted bay window above the main entrance, which lights Mr Blackie's dressing room (Mackintosh had already used the same feature in his designs for an Artist's Town House and an Artist's House and Studio in the Country). It also explains the narrow alcove extending from one of the children's bedrooms in the E. wing, which contains a floor-length, S.-facing window; and the bay window of the school room, almost like the glazed lantern of a lighthouse. Above all, what makes the exterior so arresting is the paring away of mouldings and ornamental details, which focuses attention on 'the massing of parts' referred to by Blackie. The austerity of The Hill House is all the more striking because most of its neighbours are in versions of an exuberant 'Old English' style derived from the work of Richard Norman Shaw (1831–1912) – precisely those houses of 'brick and plaster and wood beams' that Blackie had rejected for himself, such as Brantwoode of 1895 or Morar of 1903, both by William Leiper (1839–1916). The design of the conical-roofed stair-tower in the E. wing illustrates a final stage in the process of simplification: the drawings approved by the Helensburgh Dean of Guild Court in June 1902 show the top stage slightly corbelled out, but in execution even this minimal ornament was omitted and the tower became a smooth half-cylinder from ground to eaves. 15 Mackintosh's perspective drawings suggest that the capitals of the front doorway and the blank panels flanking the window of the main bedroom were meant to be carved, but this did not happen. 16 The only carved ornament is a sort of tympanum above the window of an attic bedroom on the E. side of the cross wing, simply incised with a pointed oval. The house has no string-courses, and no window sills or lintels, but the flatness is interrupted in a highly controlled way where, for instance, a chimney-stack projects slightly from the plane of a wall to cast a sharp line of shadow. The effect of these crisp shadows depends on the uniform skin of grey roughcast that spreads over every surface, even into the window reveals and over the gable parapets and chimney tops. This pale, all-enveloping skin is something Mackintosh had already employed at Windyhill, a simpler building. At The Hill House, he was able to realise more fully the kind of roughcast buildings he had previously represented only in drawings – the House for an Art Lover competition entry, and the two ideal designs for artists' houses. As at Windyhill, the principal stair is in an apsidal tower with its pitched roof hidden by a parapet. Its sheer drum dominates the N. side of the house. Mackintosh's intended billiard room at the N.W. corner would have partly obscured its base. The stair defines one side of a square rear courtyard, enclosed on the other side by the service wing. This court faces N. into the steeply sloping rear garden, making it relatively dark and unwelcoming, and its elevations are less meticulously detailed than the rest of the exterior, particularly in the placing of the downpipes. Overlooking the court are two dormers with shaped gables. After the conical-roofed tower, they are the most overt references to historic Scottish architecture in the entire house. The room immediately to the right of the front door was Blackie's library and study, lined with book cases. Its location would have isolated any business conducted there from the domestic life of the rest of the house. To the left of the front door are a large cloakroom and W.C., partly intended for users of the unbuilt billiard room. Convention dictated that billiard rooms, with their attendant noise and smoke, should be self-contained in this way, and have their own external door. The door to the courtyard from under the stairs would have served this purpose. Straight ahead of the front door, the stairs rise on the left behind a slatted timber screen, and beyond this lies the hall. As at Windyhill, it is wide enough to be used as a room, and early photographs show it furnished with table and armchairs. But at Windyhill there is a fireplace in the middle of the long wall, while in the N.-facing hall at The Hill House there is no such comforting focus: it is essentially a broad corridor, the route between the service wing and the front door, and not especially welcoming as a place in which to sit. The fireplace is in the narrow space opposite the staircase, which it was presumably intended to heat. Its flames, visible through the screen when descending, would have lit the oval stained glass insets in the wooden uprights and heated the shadowy ingle seat on the other side. The climax of the ground floor is the drawing room in the centre of the S. front. It has three distinct zones. The main part is focused on the fireplace in the N.W. corner with its mosaic surround and gesso panel by Margaret Macdonald Mackintosh. Two subsidiary spaces flow out of this: a large recess at the E. end containing the piano, and a wide bay window on the S. side, incorporating a seat and a glazed door to the terrace. The ceilings of the bay window and piano recess are at the same height as the moulding that runs all round the room, on a level with the tops of the door and chimneypiece. Originally there were pendant lights at this level in the main part of the room, subtly suggesting a consistent ceiling height throughout, as in the drawing rooms at Windyhill and 6 Florentine Terrace. Wall lights were substituted for these between November 1905 and February 1906. 17 In 1912 Mackintosh had the white ceiling and the walls above the picture rail repainted, probably in a shade described as 'plum' in his Sketcher's Notebook. 18 This may have been intended to counteract the effect of removing the pendant lights, which left the high white ceiling completely exposed and altered the spatial character of the room. The ceiling has at different times since been painted either black or white (in 2014 it is white). The dining room, by contrast, is a simple rectangle, wood-panelled, with a polished steel chimneypiece between its two S.-facing windows. Beyond it on the ground floor of the cross wing lie utilitarian service areas with a spiral stair to the upper floors at the S. end, contained in the conical-roofed turret. The principal staircase in the D-plan tower opening off the hall is the most sophisticated of a series of apsidal, dog-leg stairs in Mackintosh's buildings, in which the balustrade of slats forms a screen between the two flights. Earlier, simpler examples are at Ruchill Free Church Halls, Queen's Cross Church and Windyhill. At The Hill House, the slats are narrower and the spaces between them wider, so the enclosure feels closer to the airy wooden cage of the central staircase at the Glasgow School of Art. The structural members are artfully exposed, the beams of the first-floor landing resting visibly on the lintel of the screen opposite the hall fireplace, with their ends projecting into the stairwell. Mackintosh intended the alcove on the semicircular half landing to be a door, leading to a room within the roof space of the unbuilt billiard room. Deep floor-to-ceiling cupboards on the N. side of the first-floor corridor help create the illusion of a very thick exterior wall, reminiscent of the 17th-century Scottish tower houses that Mackintosh so admired. They enclose one end of an alcove containing a window flanked by seats, giving the impression that it is embeded in the thickness of the wall, although the window is actually a dormer. The same illusion of mass occurs on the S. side of the corridor, where the entrances to two of the bedrooms are made to feel like short passages through thick walls, though in fact they are formed by stud partitions. The overall impression of bulk and solidity contrasts with the skeletal character of the staircase. The L-shaped principal bedroom is in the S.W. corner. Like the drawing room, it is subdivided into zones: a sitting area to the left of the entrance, with fireplace and built-in couch; a dressing area straight ahead, with wardrobes, mirror and dressing table; and the double bed in its own private recess, hidden from the door, with a lower barrel vaulted ceiling. A drawing by Mackintosh shows the precise arrangement of the movable furnture. 19 The vaulted recess opening off a loftier, flat-ceilinged space is a device Mackintosh had already used in the headmaster's room at the Glasgow School of Art, and he would use it again in the rooms he designed for exhibitions in Dresden and Berlin. At The Hill House, the curve of the vault is echoed by a curved alcove scooped out of the wall on the S. side of the bed, containing the window with the external stone 'shutters'. The first floor of the cross wing contains day and night nurseries, and two bedrooms for the Blackies' children. In the day nursery, the slight curve of the oriel window follows through into the walls on either side, making a very shallow apse. In one of the bedrooms, a deep, square-ended alcove at the N.E. corner allows for a S.-facing floor-length window, with a view of the firth. Above the bedrooms, the top floor of this wing is mostly occupied by the school room, dominated by a big, semi-hexagonal bay window lined with seats and giving magnificent views. Immediately following the acquisition of the house by the Royal Incorporation of Architects in Scotland (see Later History below), Gillespie Kidd & Coia were commissioned to convert the E. wing into four flats. 25 Some of the resulting changes were reversed after the house was taken over by the National Trust for Scotland in 1982, but much of the top-floor, including the former school room, remains as a separate flat (2014). The external door at the foot of the conical-roofed tower is another of Gillespie Kidd & Coia's surviving alterations. The boundary wall along Kennedy Drive and Upper Colquhoun Street is roughcast like the house, with ashlar dressings and corner pier. At two points the stone coping dips down in a horseshoe-shaped loop, giving glimpses of the house from the street (when not obscured by foliage). This feature recalls the downward curve in Mackintosh's boundary wall at Windyhill. Within the garden, a cylindrical, conical-roofed tool shed stands at the E. end of the terrace. The massive rectilinear stone lintel over its door makes a forceful contrast with the curve of the wall, echoing the 'petrified shutters' of the principal bedroom window. The Hill House attracted little attention in the British architectural press. When drawings and photographs were exhibited at the Glasgow Institute of the Fine Arts in 1904 and 1905, and at the Royal Scottish Academy in 1906, they were noted briefly and unfavourably by a few publications. Reviewing the Institution's 1905 exhibition, and after mentioning Honeyman, Keppie & Mackintosh's building for Messrs Annan in Sauchiehall Street, the Builders' Journal and Architectural Record went on to describe 'another exhibit in the style usually associated with the last-named partner ... (309) – a house at Helensburgh which for barn-like ugliness it would be difficult to equal'. 35 It is not clear if the exhibit in question was a drawing – perhaps one of Mackintosh's perspectives – or a photograph of the newly-completed house. In 1906, The Hill House was included in the Royal Scottish Academy's exhibition, where the Glasgow Herald wrote that, among domestic work, the 'only representation of New Art – seems old already'. 38 This ambiguous remark might be a favourable comment on the timelessness of Mackintosh's design, which after only two years appeared rooted in the landscape. It seems more likely, however, that the critic thought it belonged to a fashion that had had its day. The review goes on to say that the house has 'external interest in grouping, and only needs to be carried a little further: presently it seems unfinished.' Again, the remark is ambiguous: it could be a reference to the unexecuted billiard room, or, more probably, a dig at Mackintosh's stripped-down style. 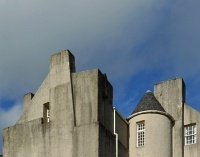 Blackie commended Mackintosh's practicality and technical proficiency, 45 but The Hill House has suffered extensively from fundamental defects in construction. The omission of all projecting copings and window sills gives the house its memorable smoothness of surface and outline, but in the wet climate of the West of Scotland, and on such an exposed site, it has also led to serious problems. Chimney tops, gables and window sills, covered by no more than a layer of roughcast, have suffered extensive damage from water penetration. The roughcast employed by Mackintosh has a high cement content that makes it hard and impermeable. Cracks have formed in it, allowing rainwater to penetrate to the underlying masonry, but the hardness of the material means this moisture cannot escape to the outside by evaporation. The walls have therefore become saturated, leading to loss of strength, dampness inside the house, and outbreaks of dry rot. Large areas of roughcast have become detached, and cavities have formed between these blisters and the masonry. In repairs carried out since taking over the house in May 1982, the National Trust for Scotland has sought to preserve as much as possible of the original fabric while recognising that more radical solutions might be necessary. In 1984–5 significant rebuilding was undertaken when the N. gable of the E. wing was reconstructed in brick and a new coat of roughcast applied. Over the rest of the house, a more conservative approach was taken in 1988–9, when areas of roughcast which had become detached were secured by injecting grout into the cavities, drilling through the roughcast and into the masonry, and inserting carbon fibre rods from which the roughcast now effectively hangs. 52 The outer ends of the rods are just below the surface and the drill holes have been filled, so they are invisible. After the work was completed, a paint finish was applied in imitation of what was believed to be the colour of Mackintosh's original roughcast. Other significant works carried out by the Trust Between 1983 and 1986 include the reslating of the roof with salvaged or matching materials; the addition of brick piers in the sub-floor, to strengthen the ground floor; and the introduction of steel beams to strengthen the E. wing. Before February 1983, the W. gable chimney had been taken down for a second time. 53 It was subsequently rebuilt. In 2012 a substantial report was produced for the Trust by Andrew P. K. Wright. 54 It presents a detailed account of past and present problems with the roughcast, which will inform future decisions about the conservation of the house. 1: Frank Arneil Walker and Fiona Sinclair, Buildings of Scotland: Argyll and Bute, London: Penguin, 2000, p. 267. 2: Frank Arneil Walker and Fiona Sinclair, Buildings of Scotland: Argyll and Bute, London: Penguin, 2000, pp. 287–91. 3: Walter W. Blackie, 'Memories of Charles Rennie Mackintosh – II', Scottish Art Review, 11, no. 4, 1968, pp. 6–11. 4: Walter W. Blackie, 'Memories of Charles Rennie Mackintosh – II', Scottish Art Review, 11, no. 4, 1968, pp. 6–11. 5: National Trust for Scotland: NTSHIHp00032; NTSHIHp00033. 6: Andrew P. K. Wright, The Hill House, Helensburgh: Evaluation of Condition and Significance, July 2012, p. 45. 7: Andrew P. K. Wright, The Hill House, Helensburgh: Evaluation of Condition and Significance, July 2012, pp. 57, 72. 8: Walter W. Blackie, 'Memories of Charles Rennie Mackintosh – II', Scottish Art Review, 11, no. 4, 1968, pp. 6–11. 9: The Hunterian, University of Glasgow: GLAHA 41857 (M207-001). A few years earlier John Honeyman had problems with the supply of Ballachulish slates for his church hall at Bridge of Allan, and resorted instead to cheaper Aberfoyle slates. 10: See, for example, James Macaulay, Charles Rennie Mackintosh: Hill House, London: Phaidon, 1994, p. 16. 11: Glenlyon House was illustrated in the Architect, 24 June 1892. 12: M. H. Baillie Scott had published a design for a country house with a square, flat-roofed bay window in the Studio in 1900. See James Macaulay, Charles Rennie Mackintosh: Hill House, London: Phaidon, 1994, p. 14. 13: Alan Crawford, Charles Rennie Mackintosh, London: Thames & Hudson, 1995, p. 105. 14: Walter W. Blackie, 'Memories of Charles Rennie Mackintosh – II', Scottish Art Review, 11, no. 4, 1968, pp. 6–11, p. 7. 15: Lochgilphead, Argyll & Bute Archives: BH/10/1902/15 (M207-010). 16: Glasgow School of Art Archives and Collections: MC.G.42 (M207-026). 17: Roger Billcliffe, Charles Rennie Mackintosh: The Complete Furniture, Furniture Drawings and Interior Designs, Moffat, Dumfriesshire: Cameron & Hollis, 4th edn, 2009, p. 167. 18: The Hunterian, University of Glasgow: Sketcher's Notebook, GLAHA 53015/11–17; 19–20. Anne Ellis, 'Recovery of the original drawing room scheme, The Hill House', Charles Rennie Mackintosh Society Newsletter, 65, Autumn 1994, pp. 5–7. 19: The Hunterian, University of Glasgow: GLAHA 41111; M207-027). 20: The Hunterian, University of Glasgow: John Honeyman & Keppie / Honeyman, Keppie & Mackintosh job book, GLAHA 53061, p. 260. 21: Glasgow, Strathclyde University Archives: T-MIN/9/1–5; T-MIN/9/7. 22: Strathclyde University Archives: www.ica-atom.org/strathclyde/ [accessed 12 February 2013]. 23: Edinburgh, Royal Commission on the Ancient and Historical Monuments of Scotland: BL 18650/1 (SC 677386). The Hunterian, University of Glasgow: John Honeyman & Keppie / Honeyman, Keppie & Mackintosh job book, GLAHA 53061, p. 261. 24: The Hunterian, University of Glasgow: Sketcher's Notebook, GLAHA 53015/11–17, 19–20. 25: The Hunterian, University of Glasgow: The Hill House building file, letter from Gillespie Kidd & Coia to A. McLaren Young, 13 July 1972. Edinburgh, Royal Commission on the Ancient and Historical Monuments of Scotland: DBD/24/8–12. 26: The Hunterian, University of Glasgow: John Honeyman & Keppie / Honeyman, Keppie & Mackintosh job book, GLAHA 53061, pp. 257–8. 27: Lochgilphead, Argyll and Bute Archives: Helensburgh Dean of Guild Court Book 1, BH/9/1, p. 207. 28: Lochgilphead, Argyll and Bute Archives: Helensburgh Dean of Guild plans, BH/10/12/1928. 29: Berlin, Werkbundarchiv, Museum der Dinge: Hermann Muthesius estate, letter from Mackintosh to Muthesius, 5 January 1903. 30: Fernando Agnoletti, 'The Hill House Helensburgh', Deutsche Kunst und Dekoration, 15, 1904–5, pp. 337–59. 31: Berlin, Werkbundarchiv, Museum der Dinge: Hermann Muthesius estate, letter from Margaret Macdonald Mackintosh to Frau Muthesius, Christmas 1904. 32: Berlin, Werkbundarchiv, Museum der Dinge: Hermann Muthesius estate, letter from Margaret Macdonald Mackintosh to Frau Muthesius, Christmas 1904. 33: The Hunterian, University of Glasgow: GLAHA 52554. The manuscript lacks the first few paragraphs of the published German translation. 34: Walter W. Blackie, 'Memories of Charles Rennie Mackintosh – II', Scottish Art Review, 11, no. 4, 1968, pp. 6–11, p. 11. 35: Builders' Journal and Architectural Record, 19, 30 March 1904, p. 151. 36: Glasgow Herald, 10 May 1905, p. 11. 37: Builders' Journal and Architectural Record, 21, 29 March 1905, p. 161. 38: Glasgow Herald, 3 March 1906, p. 9. 39: The Studio Year-book of Decorative Art, London; New York: The Studio, 1907, pp. 7, 32. 40: Pittsburgh Architectural Club, [Catalog of the] Fourth Exhibition, Carnegie Institute Galleries, Pittsburgh, 1907. 41: Charles Marriott, Modern English Architecture, London: Chapman and Hall, 1924, opposite p. 225. 42: The Hunterian, University of Glasgow: The Hill House building file, copy of letter from A. McLaren Young to R. D. Cramond, Scottish Development Department, 29 September 1971. 43: The Hunterian, University of Glasgow: The Hill House building file, letter from Gillespie Kidd & Coia to A. McLaren Young, 13 July 1972. 44: William Nail, 'News of The Hill House Helensburgh', Charles Rennie Mackintosh Society Newsletter, 40, Summer 1985, p. 6. 45: Walter W. Blackie, 'Memories of Charles Rennie Mackintosh – II', Scottish Art Review, 11, no. 4, 1968, pp. 6–11. 46: Andrew P. K. Wright, The Hill House, Helensburgh: Evaluation of Condition and Significance, July 2012, pp. 63–4. 47: Andrew P. K. Wright, The Hill House, Helensburgh: Evaluation of Condition and Significance, July 2012, pp. 64–5. 49: Charles Rennie Mackintosh Society Newsletter, 5, Autumn 1974. 50: Andrew P. K. Wright, The Hill House, Helensburgh: Evaluation of Condition and Significance, July 2012, p. 68. 51: Andrew P. K. Wright, The Hill House, Helensburgh: Evaluation of Condition and Significance, July 2012, p. 67. 52: Brian Park, 'Cracking up: Hill House', Architects' Journal, 195, 13 May 1992, pp. 41–3. 53: Andrew P. K. Wright, The Hill House, Helensburgh: Evaluation of Condition and Significance, July 2012, p. 72; pp. 77–8. 54: Andrew P. K. Wright, The Hill House, Helensburgh: Evaluation of Condition and Significance, July 2012. 55: A copy of the report (MBS33) is held by the Charles Rennie Mackintosh Society, Mackintosh Queen's Cross, 870 Garscube Road, Glasgow G20 7EL. The Mackintosh Buildings Survey was funded by The Monument Trust.